Don't even know what they're called in English! 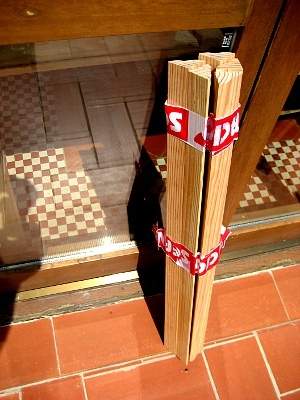 In the wood department of a large hardware store in Barcelona this week, I needed to negotiate the purchase of five lengths of moulding whose function is to prevent rainwater from entering under the doors that open on to a terrace. It was a situation which was partly familiar (routine service encounter script) but also partly unfamiliar, not least because of the vocabulary I needed, as well as certain unforeseen departures from the script, such as the fact that the wood comes in standard lengths so you have to buy more wood than you actually need. And, for anything in excess of five ‘saw cuts’, there is an extra charge. I got the wood, but not without some linguistic awkwardness. Could I have been better prepared for this situation? The notion of a situational syllabus is, of course, not new. As far back as 1966, Pit Corder wrote that “one can perfectly well envisage theoretically a course which had as its starting point an inventory of situations in which the learner would have to learn to behave verbally. These situations would be analysed into categories, some of which would be behavioural, and then, and only then, would the actual linguistic items be specified to make the situations meaningful” (p. 96). Corder was coming from a well-established tradition in British linguistics that drew on the work of J. R. Firth, central to which was the proposition that the meaning of an utterance is dependent on its “context of situation”. Obvious as it may seem to us now, it was Firth who was the first to claim that learning to use a language is a process of “learning to say what the other fellow expects us to say under the given circumstances” (1935/1957, p.28). It was left to others, such as Michael Halliday, to attempt to answer the question: “How do we get from the situation to the text?” (1978, p. 142). That is to say, what is it in the situation that determines the way the text is? Accordingly, Halliday’s project was to identify “the ecological properties of language, the features which relate it to its environment in the social system” (p. 141). The outcome of this quest is enshrined in his Introduction to Functional Grammar (1985). While linguists were wrestling with these questions, teachers were already implementing what came to be known as Situational Language Teaching. 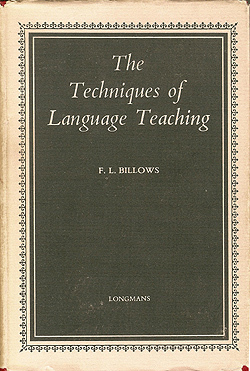 Lionel Billows’ wonderful Techniques of Language Teaching (1961) outlines the principles that underpin this approach. 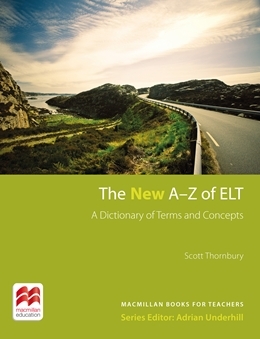 (Incidentally, the much-loved English in Situations by Robert O’Neil  is not part of the Situational Language Teaching tradition, since the situations are not the starting point of course design, but are devised solely to contextualise pre-specified grammar items). In order to ‘situate’ language learning, Billows proposes a system of concentric circles, radiating out from the learner’s immediate context (e.g. the classroom) to the world as directly experienced, the world as imagined, and the world as indirectly experienced through texts. Billows argues that we should always seek to engage the outer circles by way of the inner ones. Nowadays, of course, it is much easier, using existing technologies, to bring the outer world ‘into’ the classroom. Moreover, we are much better equipped to gather ‘thick descriptions’ of the kinds of situations our learners will need to negotiate. And, of course, the students themselves can be recruited to the task, becoming ‘ethnographers’ of their own language use. As Howard Vickers suggests, “students can prepare for a phone call or a shopping trip using a Personal Phrasebook to prepare and look up useful phrases before (or even during) the situation. Students can then record the experience (using an MP3 player or other mobile device) and bring the recording to a subsequent class”. Which makes me think, what else could I have done – using the available technology – to prepare myself for – and learn from – my wood-buying experience? And, I guess the other question is: in a general English class of learners with disparate (or undefined) needs, how could a situational focus be successfully implemented? Billows, L.F. 1961. The Techniques of Language Teaching. London: Longmans. Corder, S.P.1966. The Visual Element in Language Teaching. London: Longman. Firth, J.R. 1957. Papers in Linguistics 1934-1951. London: Oxford University Press. Halliday, M.A.K. 1978. Language as social semiotic: The social interpretation of language and meaning. London: Edward Arnold. Halliday, M.A.K. 1985. Introduction to Functional Grammar. London: Edward Arnold. O’Neil, R. 1970. English in Situations. Oxford: Oxford University Press. Absolutely – I try to manage my Japanese language learning around daily transactions, a dogme life, if you like, in which I try to plan for what I expect to happen, and reflect on what actually happened. Of course, as you point out in your final paragraph…the problem with that is when we encounter students who have no idea why they are studying, or students may rarely or never find themselves in situations in which they will need to use English. Do we limit ourselves to ‘holiday’ English? Holiday English would be a pretty broad topic. Your question reminds me of a situation when a teaching fellow teacher had to prepare some students who were going to take a residential course in the UK. Their big concern was knowing what to eat and how to order in a restaurant. He decided that it was hopeless trying to teach them every dish they would ever likely need to order. What he decided to do instead was teach them the words to describe ingredients and how food is prepared so they could ask about and understand things like “Well it’s beef roasted in an oven and served with roasted potatoes and carrots”. There is now a extension of Google Translate where you can record what you want to say in your L1 and then their amazingly powerful servers instantly translate it so you can just hold the phone up to the shopkeeper’s ear. 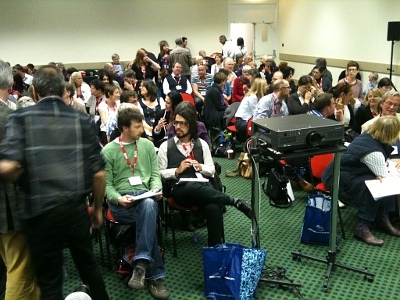 Is this is the beginning of the end for language learning? Wow, Luan. Does it actually work well, or is it like the famous translation of traffic jam into car flavoured marmalade? I had a very similar situation yesterday here in Beijing when had to run and errand and buy some dumpling wrappers from the local market. I hadn’t realised that there was a special word in Chinese for these small pieces of pastry and I had to ask somebody to write the characters and romanization down on a little piece of paper which I kept in my pocket as I walked to the market. Had I known of this need a few days ago, I could have asked my Chinese teacher to practise the situation with me, her taking the market stallholder role and recasting for me what she would say in my situation. I would have felt much more confident on my way to the market yesterday afternoon. But I wonder if it would have been worth it. How many times will I need to buy dumpling wrappers? And now that I know what they look like (little square pieces of pastry) I’ll be able to point to them or describe them if I forget that word should I ever need to buy them again. It’s not possible for us to anticipate every situation our learners are likely to get themselves into. What we can do is look for those situations which are either going to be experienced often, like phoning a government office to make inquiries or which might happen very infrequently but be very important events, like getting married. When I got married (in Chinese), I had no idea what was going on or what I was supposed to say or do! I could have done with some situational lessons for that occasion! For those more obscure situations, like buying five lengths of moulding or a stack of dumpling wrappers, I would probably focus on survival tactics (such as describing shapes and textures and clarifying what the other person is trying to say) and more general lexical sets and forms, like discussing size, quantity and price. I think sometimes our learners will learn more from muddling their way through those awkward linguistic situations – as long as they have those survival tactics and expressions up their sleeves. Good point, Chris – it’s really about acquiring a set of communication strategies that are generalisable to a wide variety of situations, perhaps. An interesting postscript to the wood-shop story is that, when I asked for the selected lengths of moulding to be sawn into smaller pieces, according to the measurements I supplied, I was told that the cuts would be perpindicular, not diagonal. If I’d had any sense, I should have asked him “Why are you telling me this?” (= communication strategy). 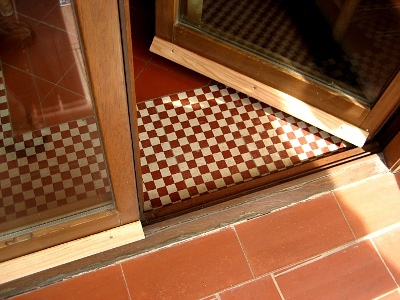 It was only during the actual operation of attaching the bits of wood to the doors that it becamse obvious that diagonal cuts would mean that the adjacent strips could overlap, thereby sealing the doors even better. But cutting the pieces on the diagonal in the shop would have meant more work for them, I assume. So the bloke was anticipating – and refusing – my request to have them cut on an angle. But my unfamiliairity with the whole situation meant I was unable to infer the point of what he was telling me. If the transaction had been in English, would I have been any the wiser, I wonder? For ESOL students in the UK this is precisely the approach we need to take. Find out about situations that the students encounter- parents’ evenings, making a doctor’s appointment etc- and the language that they encounter and need to produce. In fact, not just the language but all the features of the discourse situation. For instance, the way job interviews are carried out and the expectations of how you will present yourself vary a lot from culture to culture. The problem with applying this to students learning English abroad is that they tend to be studying EUFP- English for undefined future purposes. Thanks, Rachel – that makes perfect sense. Even for students who are studying EUFP, I guess the immediate classroom offers a ‘context of situation’, and it’s thinking of ways of exploiting that context for communicative purposes that offers a way forward. This argues strongly for establishing a ‘small culture’ (to borrow Adrian Holliday’s phrase) where the need to interact is as much socially motivated as instrumental. Yes, I completely agree about the small culture and I think that even in ESOl classes, this is still vitally important. My two experiences of language learning- Portuguese and Polish- were very different in terms of success, despite both happening over a four year stay. In Polish I became very adept at certain situations- restaurants, taxis, post office etc- and would, in those situations appear quite fluent. But in reality I had no idea how to hold a real conversation because my social interactions were all in English. In Brazil, my social interactions were in Portuguese and I became genuinely quite fluent in any situation. Of course, Portuguese is a damn sight easier than Polish too! If a class of learners can arrive at, say, a list of 10 topic areas they are interested in studying, next we could ask them to gather a list of possible situations where they can well think of themselves in using langauge connected with the topics. Take for example, a pretty universal topic hobbies. Learners find out what each of them so in their past-time and then try to envisage situations in which they would use such a topic in communication. Say, if football is a particular passion with some of the learners; all sorts of situations could be realized, from having a casual phone call with a good friend about attending a match to buying a football shirt in a shop to trying to build rapport with a new business partner or in a job interview perhaps. From the very probable real-life situations to absurd imaginary ones where we just have fun using our imaginations. And just to pick up on what Darren was saying. Sure, but I think even these guys can be engaged by particular class activities and what their peers want to talk about. I’ve spent most of my (short) career teaching adults who are studying English, but in fact rarely use it. The sense of urgency and commitment may be totally different in various class situations, but in my (limited) experience, a lack of urgency need not stop anyone having meaningful, enjoyable lessons. Thanks for your comment! It’s an interesting question – and in fact has been at the heart of much of the debate about course design that has been going on since the ‘reversion’ to a grammar syllabus in the mid 80s. That is, how can you make a grammar syllabus ‘functional’? For example, what contexts/situations/text-types best realise a syllabus item like the present perfect continuous? Or the second conditional? O’Neil’s book was not an attempt to answer those questions – it was simply an inventory of neat ways of presenting, by means of a situation, the grammar items in question, but it made no pretence that these contexts were either typical or prototypical. Corpus linguistics, on the other hand, offers – or should offer – reliable data as to the typical ‘contexts of situation’ of any given grammatical structure. Curiously, this information still seems to be elusive. Maybe that’s because grammar is broadly and thinly spread – and that what distinguishes one situation from another is less the grammar than the lexis. That is to say, given situation A, you can predict a wide variety of grammar structures, but only a relatively narrow range of lexis. Going on from Pit Corder and Scott and Halliday and Lionel Billows and Howard Vickers and others I have often wondered if there isn’t yet another possible, helpful way of classifying language – beyond a notional/functional approach (Wilkins D.A.1976. Notional Sylllabuses . A taxonomy and its relevance to foreign language curriculum development. : Oxford. Oxford University Press) to a conceptual (conceptual rhetorical? ??? one. expressing enthusiasm, polite interest, etc. for invitation to go to the cinema, the theatre, out for a meal. Of course in many cases such language is part of social behaviour – which is precisely the reason why it is important, not because it may or may not display features of linguistic interest. Or you may find Code 10/8 more useful. ” I am just very tired. I have been doing a lot lately. Or, I have just got back from a long trip. Or, I did not get to bed until late last night. There may be various causes why I am feeling so tired. But I am tired. Is there room for this kind of situational classification WITH language? How would H. Vickers proposal of basing a syllabus around “situations learners may find themselves in” differ from Michael Long’s definition (1985) of a task? How many situation-chunks could an L2 learner chunk if an L2 learner could chunk situation-chunks”? Having read your post Scott I am pleased to see that there could be a resurgence of situational-based courses. Interestingly, although I teachwith a mix of approaches, I was very aware that when living in Japan and Italy, I certainly did not learn through grammar books. Indeed, I learnt Italian without ever picking up a grammar book (can’t say the same for Japanese, however). I learnt through picking up the right adjacency pairs in everyday transactions, and imitating friends and how they responded in such situations. Both functional, like Halliday, and situational. This may be just the way I learn but it is interesting that a lot of course books still have the grammar-based approach. It may be that some learners want or expect this grammar-based approach. Indeed, last week, after having done a drama-based situational dialogue with ‘used to/usually’ slotted in by the students, one (admittedly only one) of my students (a teacher herself in her own country) said “I don’t learn this way, I need more grammar exercises”. How many of the other readers’ students expect this approach? Or are not open to new approaches/methods, even when a rationale is provided? Also, in private classes, I have always found that my students learned better when following a Billows approach of working to situations they will most likely find themselves in and tailoring the course to them in this way. To me, this seems more viable as you are only working with one or two students at a time and it would be more difficult to tailor make for a group of 16 students or varying wants/needs/goals. Do you think the grammar-based approach is a cop-out then? Or the easiest point of departure? Perhaps, in class you could try different ways of dividing the group. When using the same a text, you could calibrate activities where group A (comprised of the grammar thirsty!) focus on particular grammatical features, whilst group B focus on key lexical themes etc etc. Afterwards, mix the groups up and so you get one or two grammarians making up new groups with the lexicals and discussing their relative areas of focus, trying to bring everything together. I can relate to what you’re saying about students needing grammar and asking for it. I’ve worked in Switzerland for the past 10 years and certainly people study English at school through “learning the grammar” often with Murphy as their main book. I think it’s a matter of selling what you do to the people who “demand grammar” while really you work with emergent language and situations! I’ll give an example. Last year we had a small problem with one of our evening classes. They were already on to their 2nd teacher and were complaining yet again about this teacher. The compliments were basically that 3 people wanted “conversation” and 3 people wanting “grammar” and at various points in time each group were not perceiving their needs as being met. I decided to teach the class one evening to see what was going on. I opened the book and saw they were up to Unit X in their FCE coursebook. Part of unit X was an exercise with a picture of a bathroom, then a gap fill where students had to fill in the correct prepositions of place. Clearly a grammar type lesson on prepositions. Thinking about the situation – I suppose describing a house isn’t a common situation but their might be times where it crops up. I described my own house to them and just asked them to listen and maybe note down some key words. I went into a lot of detail. I then asked them what they could remember of the description which also lead to some more questions. The next logical step was asking them to describe in detail where they lived (and at this stage I listened in very carefully for their accurate or inaccurate use of prepositions of place) they were not thinking about prepositions of place but very involved in their descriptions. Then they did the task, slightly differently, describe the most beautiful apartment/house you’ve ever visited OR describe your mothers house. I left up the prepositions of place as a scaffold. Finally we ended up with the activity from the book with the picture of the bathroom. The students who had wanted conversation got it, the students who wanted grammar also got it. In fact the 2 are inseparable – it’s just a matter of making each stage clear to them and moving between them! But of course, this might not work with a student who wants to analyze grammar, pull it apart. For those students we could maybe give them a copy of Parrot or Swan to go home and read through in their own time. As for situations. When I moved to Switzerland I had great difficulty with the language, as Swiss German and German are almost 2 different languages. I attended language schools with very little success, I was at a loss. Then I joined a Buddhist group (this was about 10 years ago) full of local people. For about a year i just sat there hiding at the back, trying to understand what they were talking about, slowly slowly I started to become familiar with the repeatedly used phrases and expressions. After about 2 years I was joining in. After about 5 years I was leading some sessions. It did, however, result in a slightly comical situation where I was able to have fixed expressions for traditionally very difficult things, such as interdependence, perception, devotion and impermanence in German, giving the illusion that I must be an advanced speaker – but sometimes had and still have great difficulty stringing together a correct simple sentence in a shop. oooh, I just can’t resist blowing our team’s trumpet… but that’s exactly the philosophy behind Voxy’s Geo-location +phrases you hear/phrases you say + vocabulary work -we’re still in BETA so “at the hardware store” list hasn’t been published as yet, but it’s a-coming! Impressive, Karenne! This is exactly what I needed in the wood-buying situation – although I wonder if the Voxy app would cover situations so specific and relatively infrequent? But the idea is great – sign me up for the Spanish version! And how about an app for language learners which allows them to locate a language teacher and/or translator somewhere in the immediate vicinity?! A little voice in my head is wondering why you’re “figuring out what people need to say” in different situations? How about using authentic data instead? Or is this just too hard to capture? Admittedly, most corpora that I know of are not tagged for specific contexts. It would be brilliant if they were — so that you could key in, for example, ‘bank’, and get only data that was gathered in a banking context. This could be further refined into categories of increasing delicacy, e.g. bank > cashier> complaint> bank charges etc. Yup… spot on, you just heard our pain! We’re using the COCA, obviously, in our language research, namely collocations for specific vocabulary items by where they’d be used plus an endless array of real-time sources… including the rather useful YouTube videos of authentic-people-doing-their-lives. This helps us to capture the core of language. But no easy short-cuts are available as far as the eye can see (or fingers can travel through the web :D), have trawled and mined and trawled and mined. Unfortunately we’re working on spreadsheets and working on location-by-location… ‘course once the main-work is done, it’ll be an incredible reference – though some locations are “infrequent” as in your case, they are actually “frequently frequented…” the language issue you had the other day is one many an ESLearner faces, daily… plus because it’s a tech-tool (:-D) it’s easily editable, added to, crowd-sourced for further lexis! Or even a wiki-style program (with checks and balances), where anyone can submit and edit translations of different situations in the target language? If this doesn’t exist, I should. 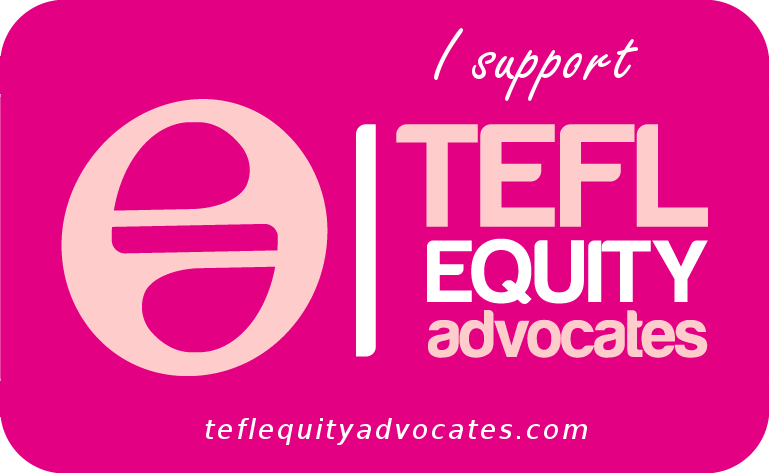 Steph’s post from real teaching life makes me wonder if it is common practice anywhere to begin language courses with a discussion with the learners about suitable, effective ways of learning a foreign language. Such discussions would at least permit some negotiation between the learners’ expectations ( about ‘grammar’ for example) and the teacher’s informed, much reflected on pedagogical convictions. Dennis, I think it’s a great idea – and I’m trying/learning to do that myself. The more we can engage learners ideas on everything to do with their studies, the better. From negotiating the lesson topics to creating rules in young learners classes to a real and continuous discussion on learning styles and methods. The only thing is, I feel we need to be realistic with how much we expect learners to come up with themselves. They often surprise me with their ideas and suggestions, but after all, they need to learn formally about the learning process as much as teachers do. We all know that much of this is far from self-explanatory or self-evident. Scaffolding needs to apply with this area of learning as much as it does with using the target language. In the search for an optimal way of categorizing language to be learned and taught (Structures? Patterns? Grammar points? Contexts? Situations? Concepts? Locations? etc.) I’d like to share this quote from M.A.K. Halliday: Learning How to Mean (Edward Arnold 1975). I guess there will be general agreement that a combination of perspectives, categories of classification is likely to work best in mapping out situations and accompanying appropriate language to be uncovered rather than an attempt to find a system that captures everything. It’s an interesting situation; I’m all for throwing out grammar and teaching situational English when I can. But there’s a curious side effect. I lived for a long time in Greece and as a consequence had to do my taxes there – something I’d never done in the UK as I’d never worked there. What happened was that in the end I knew the right Greek vocabulary for processing my taxes but was utterly unaware of how to do it in English. I think this is always going to be difficult to achieve. One idea could be when you introduce a topic such as “holidays” or “work” for example, in role play situations group or partner students with similar needs and set homework/writing tasks that are flexible and allow students to target the vocabulary and language they want to focus on. Agreed, Jon. And in fact it’s part of Howard Vickers’ approach to include role pays and simulations as a way of rehearsing situational language. Coursebooks do this to, of course, but typically the ‘situational language’ is tacked on at the end of the unit, as a kind of afterthought. For small, 75 minute conversation classes, I prefer practicing situations. Where as a few years ago, I was doing a task-based program. TBLT took weeks to finish a cycle. Now we practice a situation and finish up in just a few sessions. I feel it’s a good fit for my, situation. If situational presentations are going to make a comeback, perhaps we might soon see presentations at conferences (and maybe a book in the CUP series) about making use of portable sandboxes (strongly recommended by Billows).